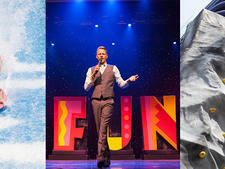 Crazy about adventure but still want all the creature comforts? 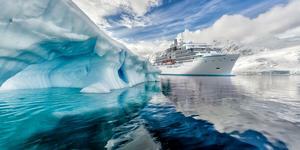 An expedition cruise might just be the right fit to get your adrenalin pumping. Find out about all the new adventure cruise ships on the horizon in our chart below. 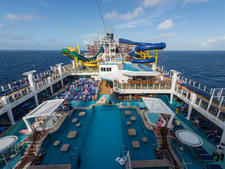 But if you are more of a mainstream cruise fan then we've got that covered: New Cruise Ships on Order. Or perhaps Luxury floats your boat? 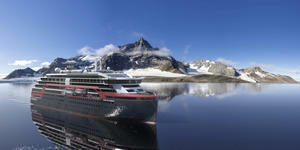 If so, check out New Luxury Cruise Ships on Orderarticle. 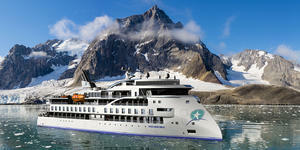 Long-time river veteran Scenic is making the leap to the luxury expedition ocean market in a big way. The company will launch its all-suite super yacht with some seriously impressive features, including a fleet of zodiacs, two helicopters and a seven-person submarine. 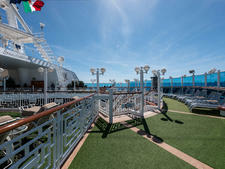 The ship will also boast a 1:1 passenger-to-staff ratio as well as cabins that start at an impressive 344 square feet. 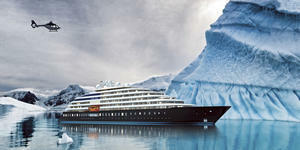 But the most exciting feature might actually be the ship's itineraries, which include the deep Arctic and Antarctica, thanks to the vessel's ice-class rating and stabilizer. During polar expeditions, Scenic Eclipse will make several landings a day. 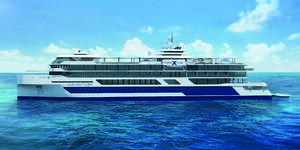 The third of six new expedition ships for Ponant, Le Bougainville will feature two restaurants, a 188-seat theater, lounge areas that open to the outside, an aft marina for Zodiac launching and easy access to kayaking and paddle boarding, and a pool with counter-current swim technology. Coral Adventurer will be the fourth expedition ship in Coral Expeditions' fleet and will be designed for ocean voyages to remote areas. It will feature two "Xplorer" tenders mounted on hydraulic platforms for easy access without steps, all outside-facing cabins -- half of which will have private balconies, and public spaces that include a lecture lounge, dining room, observation lounge, gym and indoor and outdoor bars. Rooms will range in size from 183 square feet to 463 square feet. 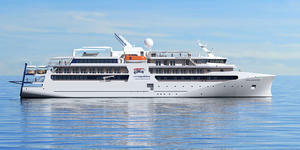 Celebrity Flora will be a 100-passegner, all-suite vessel designed specifically to sail the Galapagos archipelago. It will feature an abundance of floor-to-ceiling glass windows throughout, two dining areas, suites with either full balconies or Infinite Verandas, several lounges, a marina large enough to hold three Zodiacs at one time, and the latest in environmentally-friendly operating systems. 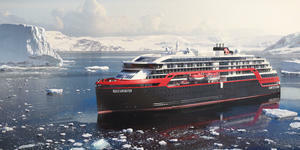 Roald Amundsen will be the first of three hybrid ships Hurtigruten is building, designed to cut emissions by sailing partially with electrical propulsion. The ship will have three restaurants. Though it is being designed specifically for polar waters, it will have a pool deck with an infinity pool, Jacuzzis and bars. The ice-rated Polar Class 6 vessel will be one of the strongest ice-strengthened vessel in the polar regions and will have seven suites with balconies, eight cabins with French balconies and a variety of inside, outside, porthole and quadruple rooms. An entire deck has been given over to an observation lounge and a separate lecture room for simultaneous or multi-language lectures and presentations. 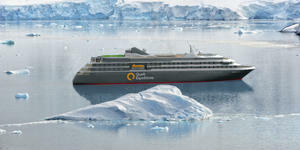 Quark's new ship in the Antarctic will be an 86-cabin, 176-passenger, all-suite vessel with a glass-domed Observation Lounge, dedicated lecture theater, Explorer Lounge, library, shop, small gym (with changing rooms and sauna), outdoor running track and small spa. All cabins will have either a private walk-out balcony or a shallow Juliet balcony. The 104-metre ice-class 1A Greg Mortimer will be built to the latest polar code specifications and feature a custom-designed platform for kayakers and divers, a dedicated sea-level Zodiac loading platform for easy boarding, plus a mud room. Other features will include cabin balconies, gymnasium, sauna and spa, a 180-degree indoor observation deck and plenty of outdoor viewing areas. 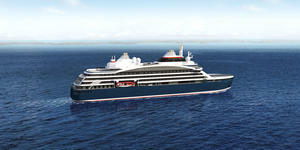 The fourth of six new expedition ships ordered by Ponant, Le Dumont d'Urville will feature two restaurants, a 188-seat theater, lounge areas that open to the outside, an aft marina for Zodiac launching and easy access to kayaking and paddle-boarding, and a pool with counter-current swim technology. 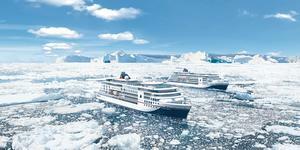 The second of two new luxury expedition ships being built for Hapag-Lloyd, Hanseatic Inspiration will serve international cruisers. The ship will feature Ocean Academy, where cruisers can use a variety of technologies to learn more about the regions they're visiting, an expandable glass balcony that puts cruisers closer to the sea and the regions they visit and a variety of cabins across multiple categories, all with ocean views. An onboard specialty restaurant will offer a unique blend of Peruvian and Japanese cooking. The 50-cabin, Polar Class 6 ice-class ship will feature five cabin categories ranging in size from 220 to 440 square feet, including dedicated single cabins and 16 adjoining cabins. 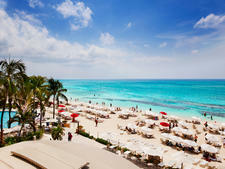 Forty-two of the cabins will have balconies. The ship will also feature a large forward-facing observation lounge, a main dining room, a protected outdoor barbecue area, a gym and sauna, gift shop and two meeting rooms. 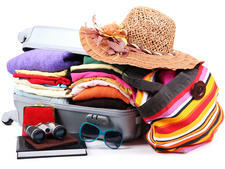 Adventure activities, such as kayaking and snowshoeing, will be available to passengers. National Geographic Endurance, Lindblad's first polar-specific expedition ship, will be built in Norway and have 69 cabins, 75 percent of which will have balconies. Twelve cabins will be designed for solo travelers. The ship will have one main dining room and an outdoor barbecue and bistro spot; it will also feature a spa and fitness area with treatment rooms, saunas, a fitness room, a relaxation area and yoga room. Plus, there will be two infinity Jacuzzis. The vessel will have a high ice class so it can go deeper into the polar regions that some other polar ships and will have expanded fuel and water tanks for extended operations in remote areas. The 100-passenger Silver Origin is being purpose built to sail the Galapagos Islands. No further details have been announced. Crystal's first mega-yacht will be built to cruise polar regions, with state-of-the-art technology and toys such as a submarine and helicopters. The ship will be luxurious and spacious, with suites ranging from 300 to 1,130 square feet, plus a large spa, theater, multiple dining venues and a lounge with panoramic views. 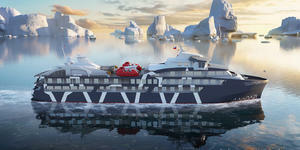 Fridtjof Nansen will be the second of three hybrid ships Hurtigruten is building, designed to cut emissions by sailing partially with electrical propulsion. The ship will have three restaurants. Though it is being designed specifically for polar waters, it will have a pool deck with an infinity pool, Jacuzzis and bars. This polar expedition ship will carry two helicopters and a fleet of 20 Zodiacs, with four Zodiac embarkation points to speed up the ship-to-shore landing process. It will also have a modern spa and fitness facility and more than one restaurant. The ship will have a 40-day operational capacity thanks to a design that optimizes the use of fuel, water provisioning and waste handling. 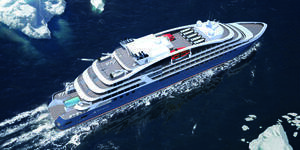 Ponant's icebreaker, Le Commandant Charcot, will a 136-stateroom electric hybrid cruise vessel with icebreaker characteristics and dual fuel propulsion, featuring high-capacity batteries and LNG fuel. It will carry two helicopters housed in an on-board hangar. 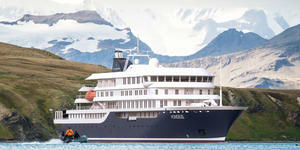 Scenic's second ocean vessel is touted as a discovery yacht. Launching in the 2021, the all-suite, 228-passenger ship (200 in polar regions) will have an onboard marina equipped with two helicopters (with a helipad and hangars), a submarine, kayaks and a fleet of Zodiacs. Built to the highest passenger ship ice-class rating, it will be able to operate in the Arctic and Antarctica for three months of the year. The 10-deck ship will also have a spa, 10 dining options, eight bars, outdoor terraces, multiple pool areas, gym and fitness rooms, a theater, observatory and library. Other luxuries include an almost 1:1 staff-to-guest ratio, butler service, lavish interiors and an all-inclusive program with fares covering meals, drinks, Wi-Fi, tips, e-bikes and excursions. This as-yet-unnamed hybrid expedition ship will be the third of a series Hurtigruten is building, designed to cut emissions by sailing partially with electrical propulsion. The ship will have three restaurants. Though it is being designed specifically for polar waters, it will have a pool deck with an infinity pool, Jacuzzis and bars. Seabourn's first expedition ship will carry up to 264 passengers in 132 veranda suites. It will have two submarines, 24 Zodiac boats and a fleet of kayaks. It is scheduled to sail in the Arctic in late summer 2021, with a full winter season in Antarctica to follow. 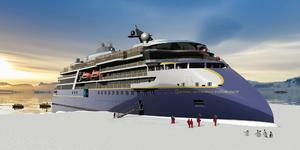 This will be Lindblad's second polar ship built specifically for the cruise line. 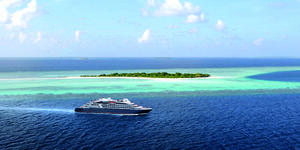 Seabourn's second expedition ship will carry up to 264 passengers in 132 veranda suites. It will have two submarines, 24 Zodiac boats and a fleet of kayaks.